We’re starting to ramp up for Children’s Book Week (USA & Canada), which this year runs 4th to 10th May 2015. Most of the effort goes in that week itself, and I’ll be doing some special offers on my books to help the cause of literacy and love of reading. You can sign up to be a CBW Champion and to get useful stuff in the Digital Toolkit and you may want to get started with an activity that will culminate in the announcement of Children’s and Teen Book of the Year. Voting opens tomorrow, March 17 and runs to May 3rd. Click here to go to the voting area for both awards. Last year’s Teen Award went to Veronica Roth for Allegiant; previous winners have included The Fault in Our Stars and Clockwork Prince. I’ve actually read the previous winners! Amazing! Great resource. Thanks for sharing this on the Kid Lit Blog Hop! 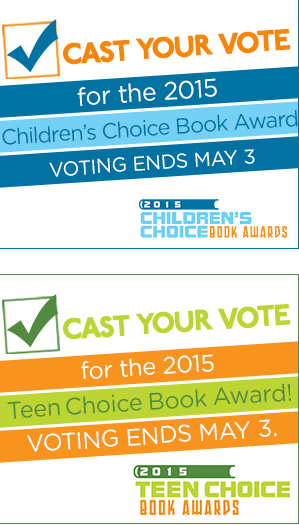 I love that only young readers can vote for these awards. I ordered my poster weeks ago and can’t wait to display it. Thanks for sharing, Jemima. Stopping by from the Kid Lit Blog Hop.